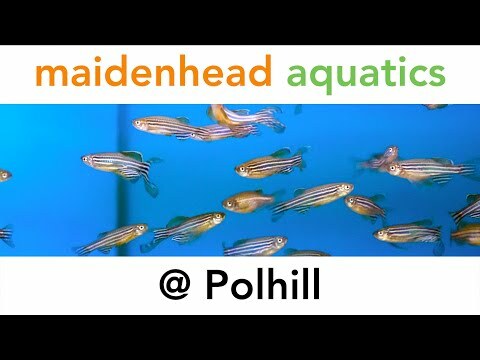 Maidenhead Aquatics at Polhill is the pefect place to visit for the avid outdoor fishkeeper, with a fish house containing a 12,000 litre koi pond and boasting fish up to 85cm. A unique glass viewing window gives the customer a rare view into a koi pond. Smaller koi are also available from six glass koi stock tanks. We also have a huge outdoor section which includes normal pond fish, preformed fish ponds, pond liners, Pond plants, Waterfalls and Water features. A wide range of tropical fish are also catered for in store, from the more common fish species to advanced species including a collection of rare "L-number" catfish in over one hundred and fifty well-stocked tanks. A wide range of aquariums and accessories are available from our light and airy shop. A large 180cm Mbuna community aquarium greets you as you enter the shop and perfectly complements our range of African cichlids. Tropical marine fish and invertebrates are well-represented in the store. We boast a 180cm tropical saltwater aquarium and a well-stocked invert system which holds a 180cm coral tray and twenty systemized fish tanks. A wide range of equipment is available for the marine hobbyist. Polhill also caters for the coldwater enthusiast with eighteen systemized aquariums which have fish ranging from goldfish, ornamental goldfish and a selection of smaller coldwater fish and loaches. Small starter aquariums are available - ideal for the newcomer to the hobby.